black holes at their cores produce fewer stars than galaxies with less active black holes. The results are the first to demonstrate black holes suppressed galactic star formation when the universe was less than half its current age. Herschel is a European Space Agency-led mission with important NASA contributions. Supermassive black holes, weighing as much as millions of suns, are believed to reside in the hearts of all large galaxies. When gas falls upon these monsters, the material is accelerated and heated around the black hole, releasing great torrents of energy. 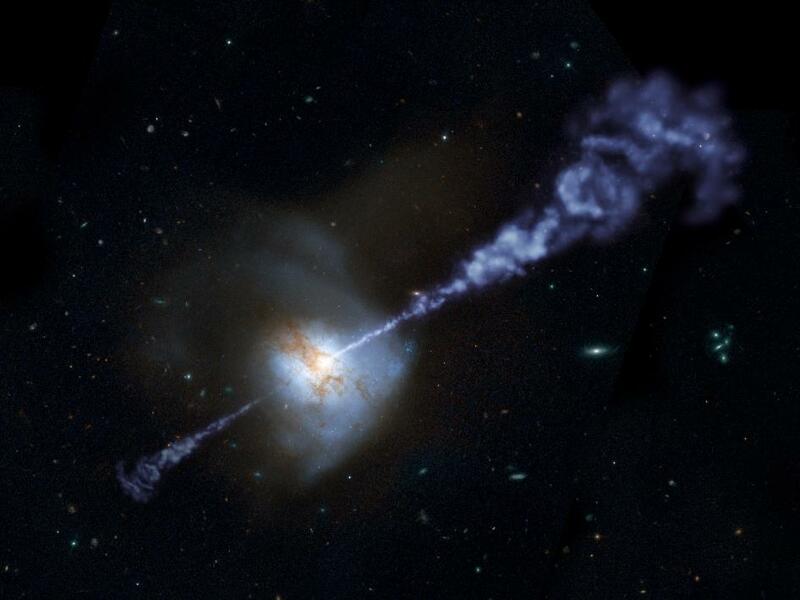 Earlier in the history of the universe, these giant, luminous black holes, called active galactic nuclei,or AGN, were often much brighter and more energetic. Star formation was also livelier back then. Studies of nearby galaxies suggest active black holes can squeeze star formation. The revved-up, central black holes likely heat up and disperse the galactic reservoirs of cold gas needed to create new stars. These studies have only provided “snapshots” in time, however, leaving the overall relationship of active galactic nuclei and star formation unclear, especially over the cosmic history of galaxy formation. For the new study, Mathew Page of University College London’s Mullard Space Science Laboratory in the United Kingdom and colleagues used Herschel data that probed 65 galaxies at wavelengths equivalent to the thickness of several sheets of office paper, a region of the light spectrum known as far-infrared. These wavelengths reveal the rate of star formation, because most of the energy released by developing stars heats surrounding dust, which then re-radiates starlight out in far-infrared wavelengths.The researchers compared their infrared readings with X-rays streaming from the active central black holes in the survey’s galaxies, measured by NASA’s Chandra X-ray Observatory. At lower intensities, the black holes’ brightness and star formation increased in sync. However, star formation dropped off in galaxies with the most energetic central black holes. Astronomers think inflows of gas fuel new stars and supermassive black holes. Feed a black hole too much, however, and it starts spewing radiation into the galaxy that prevents raw material from coalescing into new stars. Where Will Fall Russian Mars Probe?